The Industrial Revolution was underpinned by the fortunes of a few dozen financiers, the blood, sweat and tears of millions of factory workers, and a handful of key technical innovations. One of the key inventions of the mid-19th century was the Bourdon gauge. Eugene Bourdon (1808 – 1884) was a brilliant French watchmaker and engineer who invented the Bourdon gauge in 1849. This revolutionary new pressure measurement device enabled accurate measurement of much higher pressures than existing measurement devices. Bourdon designed the device for steam locomotive engines, but the notably more useful and robust pressure measurement device allowed engineers to develop a range of industrial machinery that operated at higher pressures. Besides its relative simplicity and accuracy, the Bourdon gauge can measure much higher pressures than the U-tube manometer pressure gauges used at the time. 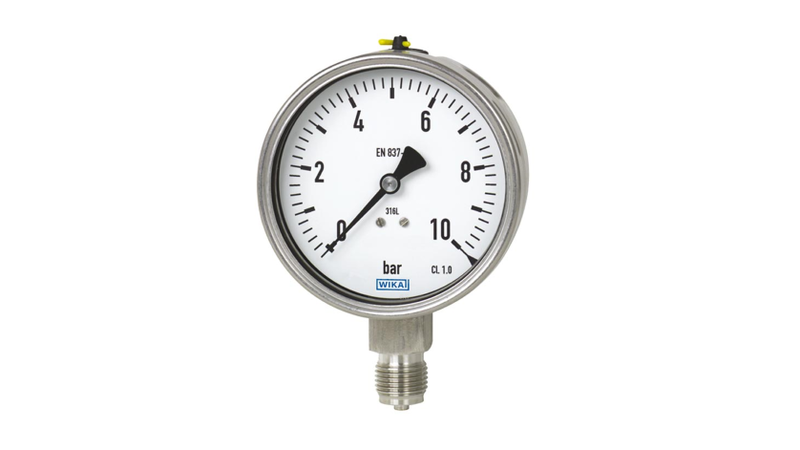 With the Bourdon gauge, engineers could now measure pressures in excess of 100,000 psi. Eugene Bourdon decided to try to develop this new type of pressure measurement device in the late 1840s because of the increasing number of horrific accidents involving very high-pressure steam locomotive engines. The accident rate and number of deaths from steam engine explosions dropped significantly within a couple of years of the introduction of the Bourdon gauge. A Bourdon tube gauge is a hollow, C-shaped spring tube that is closed and sealed at one end. The opposite end is bonded to the socket of the connection to the medium for measurement. When the pressure medium enters the eponymous Bourdon tube, the pressure differential causes the tube to move (contract or expand). The direction the tube moves is determined by the curvature of the tubing (the inside radius is less than the outside radius). Depending on the design of the Bourdon tube, a predetermined amount of pressure will cause the C shape to move (open) a specific distance. However, when the pressure is no longer present, the tube returns to its original shape and the end connected to the pointer returns to its original position relative to the socket. Bourdon founded his own company in 1850 to manufacture the popular new pressure gauge. The Bourdon Sedeme Company produced a range of industrial pressure gauges until the patent rights to the device ended in 1875. In an interesting historical and technological note, the first commercially successful diaphragm pressure gauge was also patented in 1849 by Bernard Schaeffer in Magdeburg, Germany. Bourdon and Schaeffer actually met at the famous London World Exhibition in 1851. Schaeffer’s firm, Schaeffer and Budenberg, also began manufacturing Bourdon tube gauges in 1875, and eventually became a successful gauge manufacturer that is still in business today. Bourdon was also awarded the chevalier de la Légion d’honneur for his invention by the French government in 1851. Although there are many other ways to measure pressure today, millions of Bourdon gauges are still sold every year. Instrument industry leader WIKA sells more of these highly refined and specialized pressure measurement devices than any other manufacturer worldwide. Call or email WIKA’s knowledgeable technical support team if you have any questions about Bourdon gauges or industrial instrumentation.